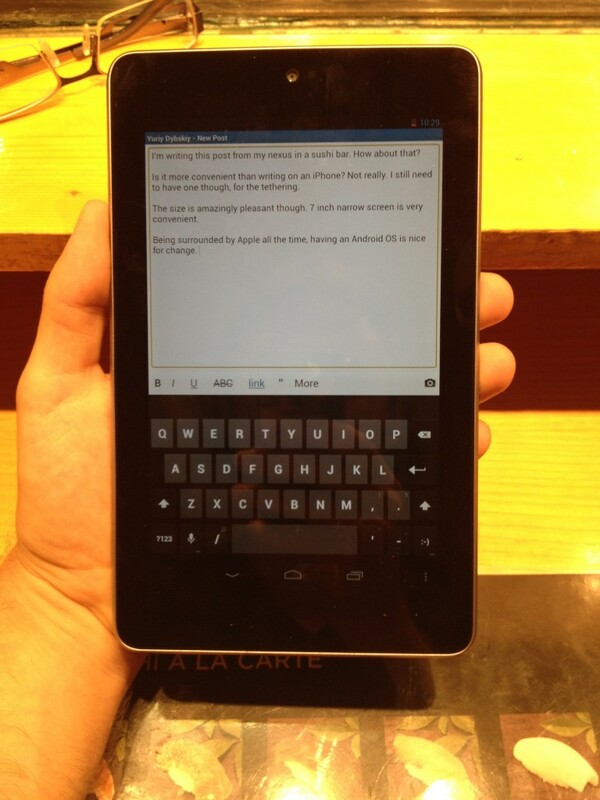 I’m writing this post from my nexus in a sushi bar. Is it more convenient than writing on an iPhone? Not really. I still need to have one — for tethering. The size is amazingly pleasant though. 7 inch narrow screen is very convenient. It’s a fun experiment — immersing yourself into a new ecosystem. Being surrounded by Apple all the time, having an Android OS is nice for change. I wanted to have an android device ever since they came out, but iPhone was always superior to Google counterparts. Main reason is Google maps. I bike a lot so having a bike paths layer always appealed to me. Is nexus 7 superior to Apple’s iPad? Nope, built quality and screen quality are much lower. Price doesn’t really justify it. What’s interesting is that Apple now has to defend the 7 inch niche and trust me, it’s here to stay. Jelly Bean is fast. Most apps aren’t though. Chrome is a bit of a disappointment too — browsing in Firefox is much smoother. Gmail lacks unified inbox. I wonder for how long can Google pretend that people have only one account? Google maps aren’t very snappy either — apple is still unbeatable here, but the ability to cache certain part of the map really comes handy. I wish they could cache bike path too. I’ll post the list of nice apps to have later, but for now I must say its a really comfortable form-factor so I’m looking forward to what apple will respond with.